"Ghosts of the Past" / "Claw and Chain" / "Dancing in the Dark" / "Uneasy Alliance" / "Mutants, Ninjas, and Demons" / "Brass Tactics" / "Confession is Good for the Soulless" / "Final Act"
Issue #64: In Madripoor and Brooklyn, respectively, Wolverine and Ghost Rider are both attacked by ninjas sent by Deathwatch. 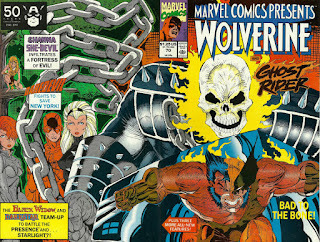 Issue #65: Wolverine and Ghost Rider track the ninjas to a cemetery in Brooklyn, where they've taken a captive woman. Each believing the other to be working for Deathwatch, the two heroes fight, knocking each other out. Just then, the captive woman and a mysterious stranger kill the ninjas, then decide to take the unconscious heroes to their father. 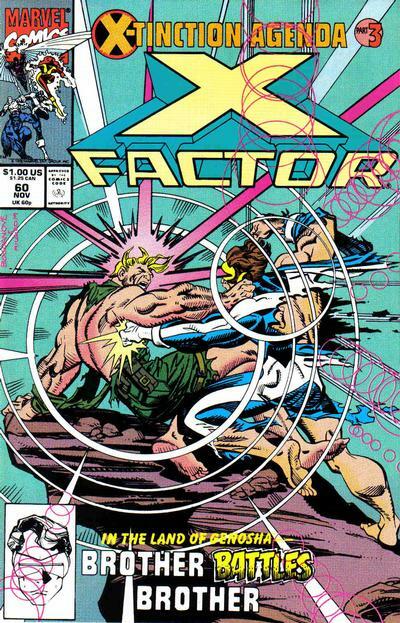 Issue #66: Their father arrives and dispatches his son, saying he and Brigite can tend to the fallen heroes. Just then, Ghost Rider wakes up and races off. Later, Ghost Rider is once again attacked by Deathwatch ninjas, while a recovered Wolverine is attacked by a shadowy figure before being approached by Brigitte at the same time Ghost Rider meets her father. 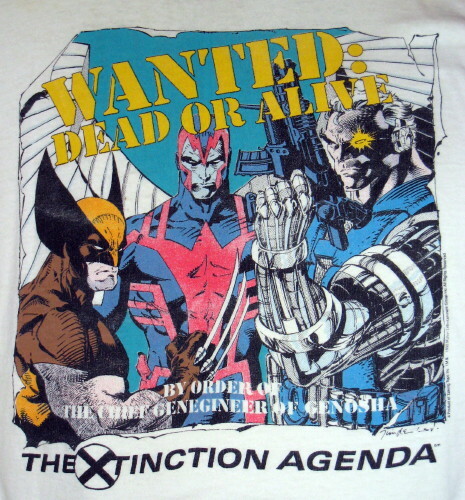 A "business as usual" month, as we return to the regular rotation and wrap up "X-Tinction Agenda"! Han, Luke and Leia are forced to seek refuge on the Wheel. En route back to the Yavin system aboard the Millennium Falcon, Luke suddenly falls unconscious. Han and Leia watch Artoo's recording of Luke's lightsaber training session, and discover that just before he was knocked out, he attempted a form of Jedi meditation taught to him by Ben. Dropping out of hyperspace to find a medical facility for Luke, the Falcon finds itself in the middle of an Imperial zone, the auto-navigator having taken the ship off course. Coming across a damaged merchant ship and an injured Rebel floating in space, Han retrieves the Rebel and brings aboard, where he explains that Imperials destroyed the ship but did so in a manner to frame the Rebels, including leaving previously-captured Rebels like himself on the ship. Just then, a Star Destroyer under the command of Commander Strom appears, targeting the Falcon. Warlock dies as Cameron Hodge returns. 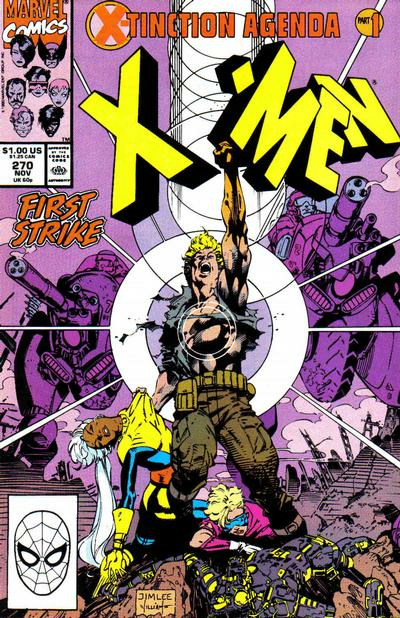 Art: Rob Liefeld & Co.
Inker: Joe Rubinstein & Co.
Storm, Boom-Boom, Rictor, Wolfsbane & Warlock arrive in Genosha, and are confronted by the new Genoshan commander, Cameron Hodge, now just a severed head attached to monstrous robotic body. They attempt to fight back, but Hodge calls in Wipeout to remove their powers. Back at the X-Mansion, the remaining New Mutants and X-Men scout the site of the Genoshan attack, but are unable to identify the Genoshans from their discarded equipment. Back in Genosha, Storm and the New Mutants attempt to help Warlock, who lost much of his life-energy during Pipeline's transit. Just then Hodge enters their cell and takes away Warlock, declaring that he's going to appropriate Warlock's power so he can regain his normal form. Hodge proceeds to bring Warlock to the Genegineer, declaring he needs his help to absorb Warlock's power, but the Genegineer argues that Warlock should be used to the benefit of the state, like all mutants. A tale of Luke's past. 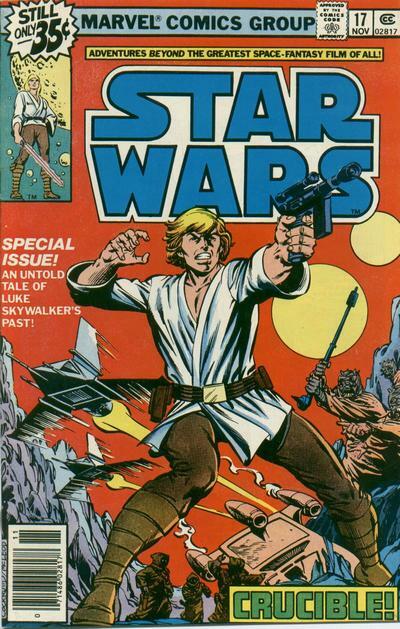 During his watch shift aboard the Millennium Falcon, Luke thinks back to an earlier time on Tatooine. After bullseyeing a womp rat, Luke returns home and gets permission to attend a party for Biggs the next day, who is leaving soon for the academy. What he doesn't tell his aunt and uncle is that the party is actually a race through the dangerous Beggar's Canyon. The next day, the race begins, with Biggs & Luke pulling out to an early lead. Eventually, Biggs wins thanks to a daring stunt. 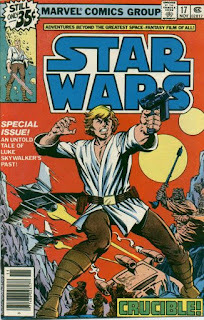 As Luke and his friends gather afterwards, they're suddenly interrupted by an injured milita scout crashing nearby, carrying a warning that a group of Tusken Raiders have killed some gun smugglers, and are now marching on Anchorhead, well-armed and prepared to take out any farms in between. As the kids come under fire from the Tusken Raiders, Luke and Biggs race to one of the skyhoppers, hoping to warn the farmers, including Luke's family. 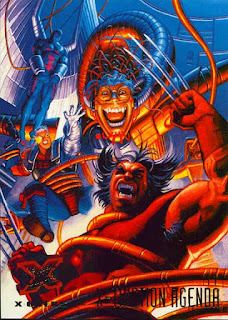 The Genoshans launch their assault on the X-Men. 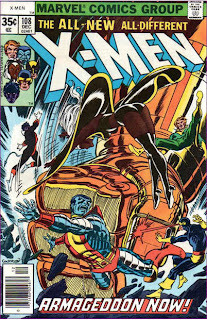 Amidst rising tensions between Genosha and the United States, Storm & Marvel Girl train in the Danger Room, as Banshee & Forge attempt to analyze Storm's current power level now that her body is that of an adolescent. Suddenly, Cable bursts into the Danger Room declaring it's time for the New Mutants' training session. 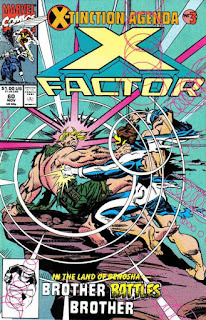 In Malibu, Guido runs off Freddie Stanachek, telling her Dazzler has left and he doesn't know where, just as Lila suddenly appears on the beach, saying she needs the X-Men's help. Back in New York, Storm and Jean reminisce as they're unknowingly watched by a group of Genoshan magistrates. 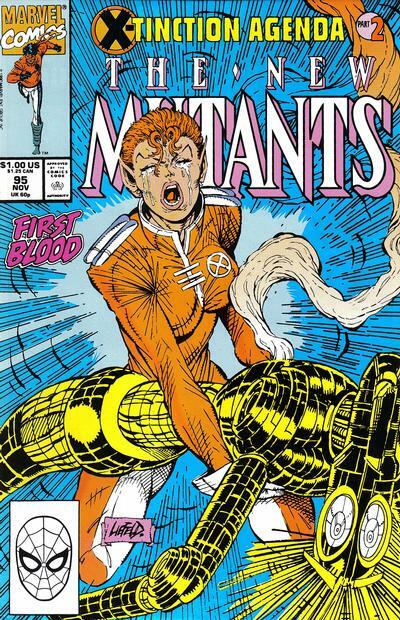 Returning to the school grounds, Storm bids Jean goodbye as the New Mutants relax by the lake, and Rahne angrily confronts her, upset that Doug remains dead while Storm, Jean & the X-Men get to come back to life. Just then, the Genoshans launch their attack, but the New Mutants manage to hold them off, until the Genoshans call in a larger force. Valance the Hunter stalks the Star-Hoppers, searching for Luke Skywalker. During the midst of a raid on a medical facility on Telos-4, a former Stormtrooper officer-turned-bounty hunter named Valance overhears a dying Don-Wan Kihotay speak of the Star-Hoppers including, specifically, a boy and his droid. Overhearing this, Valance orders his men out, telling them they have a new job. As they fly away from Telos-4, destroying the facility, Valance tells his men to focus on finding Jaxxon, who should be the easiest of the Star-Hoppers to find. 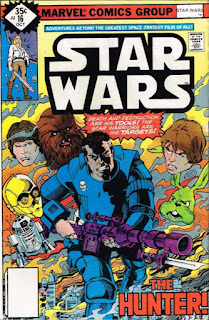 Later, Jaxxon is captured by Valance's men and tortured for the name of the planet where he helped Han Solo. Amaiza intervenes, rescuing Jaxxon, but she mentions Aduba-3, giving Valance's men what they want to know. 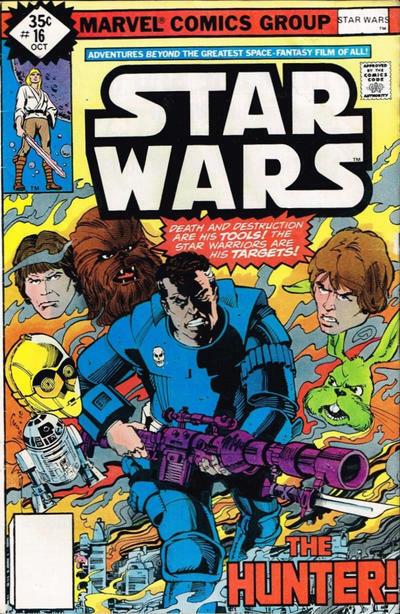 The pair races to the planet to warn Jimm the Starkiller Kid, and they devise a plan for dealing with Valance. 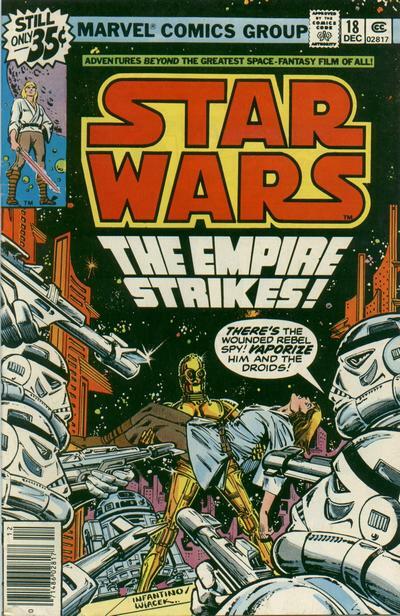 Arriving in orbit around Aduba-3, Valance goes over the reports of the destruction of the Death Star once more, hoping that the "boy and his droid" on Aduba-3 is the same boy who helped destroy the Death Star with the friendship of droids. 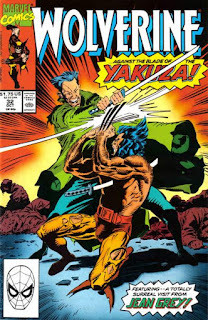 Wolverine struggles to heal himself as Dai-Kumo returns to Japan. A badly injured Wolverine wakes from hallucination to find Tyger Tiger & Archie Corrigan tending to his wounds. Meanwhile, in the central highlands of Madripoor, General Coy's men harvest the spider monkeys needed by Dai-Kumo to create his Thunderbolt drug, much to the consternation of a native guide forced to help them. Just then Dai-Kumo receives a call from Goro, telling him Wolverine isn't dead after all. He insists that Goro finish the job, and bring him proof of Wolverine's death this time. Back at Tyger's penthouse, she leaves to try and track down Dai-Kumo while Archie goes to check on the Princess Bar, just as Goro arrives to kill Wolverine. 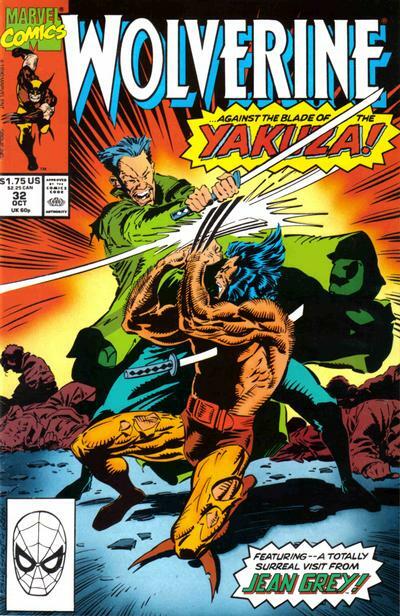 He easily dispatches the guards left by Tyger, then manages to stab the still-recovering Wolverine in the heart, causing him to collapse. "'Twas a Dark and Stormy Night..."
When Meggan suddenly turns into a vampire, Dr. Strange is called in to help. As Brigadier Stuart arrives at Excalibur's lighthouse for a party in her brother Alexander and Meggan's honor, she's greeted by a strangely-transformed Meggan bursting through the door, followed shortly by Captain Britain. Alexander explains that Meggan has transformed into a vampire and knocked out Rachel, while Alexander has locked Nightcrawler in a closet, fearing he too has turned. Meanwhile, Captain Britain, Lockheed & Widget chase after Meggan, as Alexander realizes they need to call on Dr. Strange for help. In London, Meggan attacks Captain Britain, and when a crowd gathers, she transforms into her normal appearance and claims Captain Britain attacked her, inciting the crowd against him, allowing her to escape. Dr. 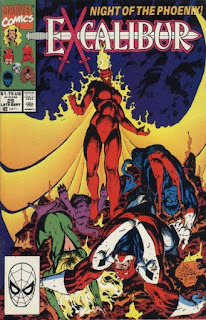 Strange arrives at the lighthouse and confirms that Nightcrawler is not a vampire, while Captain Britain manages to tackle Meggan just as Widget opens a portal. They arrive in the lighthouse's basement, and Dr. Strange examines Meggan, determining she's being affected by energy released recently by a spell from the Book of the Darkhold. Dr. 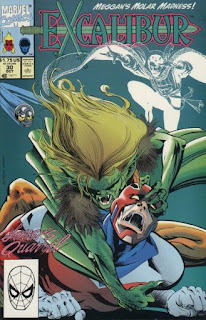 Strange manages to return Meggan to normal, then departs, as Excalibur begins teasing Alexander for assuming Nightcrawler was a vampire due to his always-fang-like teeth. Excalibur helps Power Pack battle Nightmare. When Excalibur investigates a large alien ship that suddenly appears above their lighthouse, they discover it carries Alex Power of Power Pack. He explains that he and his family, as well as Franklin Richards, were taking their mother to a special psychic institute in London to help with her illness, when everyone was suddenly gassed and knocked out. Alex managed to escape, however, and came looking for the help of his old friends Nightcrawler & Shadowcat, whom he knew were now part of Excalibur. Together, Alex and Excalibur infiltrate the hospital, but end up gassed themselves, and carried through a portal by a group of demons. Individually, everyone experiences a different kind of nightmare, playing on their individual fears, the work of the villain Nightmare, who has enslaved Phoenix and is feeding on their psychic energy. However, Franklin Richards helps Phoenix break free of Nightmare's control by taking control of her via his dreamself, and she seemingly destroys Nightmare. The next morning Excalibur wakes up, having all experienced similar, shared dreams, while the Power family flies away from the psychic institute, the whole trip having been a waste of time. 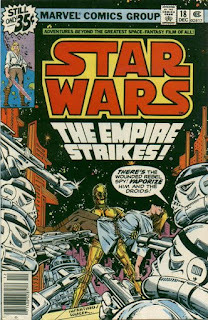 (Apologies for the back-to-back non-comic book review posts; Disney keeps throwing newsworthy Star Wars stuff at us...). Yesterday was Force Friday, described by some as "Star Wars Christmas", the day in which an enormous wave of new and Force Awakens-centric Star Wars product was released, everything from new action figures and Lego sets to new Star Wars-branded clothes, books and games. Many stores were opening at midnight, with cosplayers present, creating something of a carnival atmosphere. In my younger days, I absolutely would have been one of those rushing the doors at midnight, even if, then as now, there wasn't a whole lot of product specifically I wanted or had to get right away. 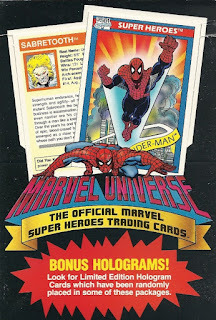 162 cards plus 5 Hologram chase cards (Cosmic Spider-Man, Magneto, Silver Surfer, Wolverine, Spider-Man vs. Green Goblin). White border framed front image, cardback features headshot, statistics, biographical info, and "Did You Know" box at the bottom. Cardback Statistical Categories: Real Name, Group Affiliation, Height, Weight, Battles Fought, Wins, Losses, Ties, Win Percentage, Nicknames (when applicable), Arch-Enemies and First Appearance. 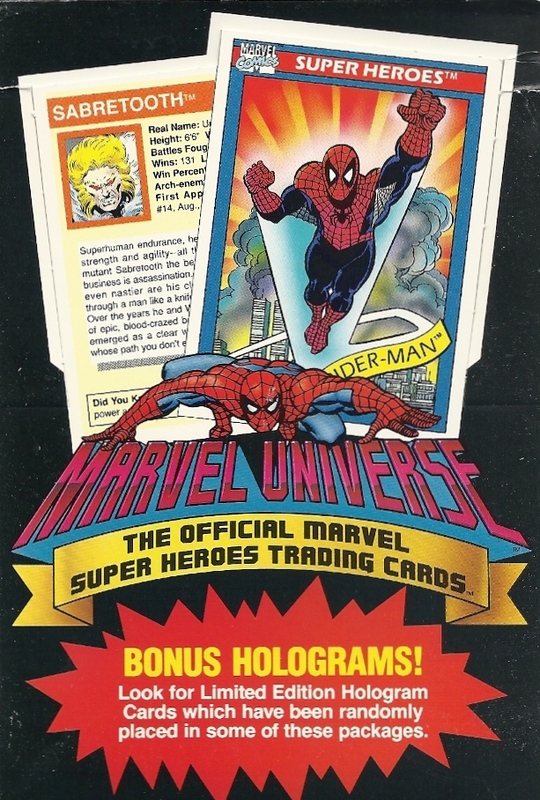 Super Heroes, Super Villains, Rookies, Famous Battles, MVCs (Most Valuable Comics) , Team Pictures, Spider-Man Presents.